When I first started reading comics as a kid I fell in love with them, the vibe of the stories from the sixties and seventies really did something for me and to me. I get the same vibe from Tom Strong. 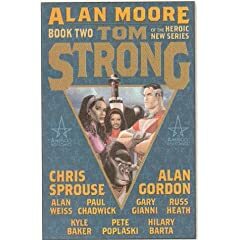 Created by Alan Moore and Chris Sprouse, Tom Strong has become one of my favorite comics. 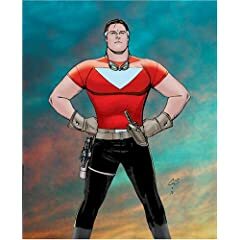 In fact I love Moore’s whole line of America’s Best Comics; League Of Extrodinary Gentleman, Prometheus, Terra Obscura, Tomorrow Stories and all the others. But, Tom Strong is my favorite of the line. 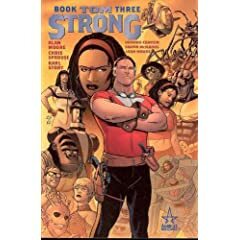 Strong is a Science Hero living in Millenium City with his wife Dhalua and daughter Tesla who are also both heroes. Tom’s origins are unique, which in today’s comics world is refreshing. His parents back in 1899 went to the island of Attabr Teru to raise there son to be special. 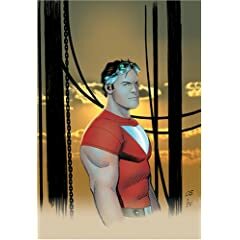 He spent his youth in a grvity well to make him stronger, and was tutored by a pnuematic robot to make him smarter. After an accident claimed the lives of his parents he was taken in by the natives of the island. It was here he first met his wife, Dhalua. It was also here that he first started using a native plant, which has given him extended life. The series is great fun in the way the old pulps and serials were. Science villians trying to conquer the world, and grand adventures. Other dimensional aztecs, beings from other planets and scientists gone bad. It’s great fun. The latest volume, #5 of the collected issues, opens with a story in which air travel is halted, and Tom must re negotiate use of the atmosphere with extra ordinary beings.He then meets Jenny Panic, a girl whose dreams can change reality. After following this with a unique ar thief Tom confronts a henchman of an old foe who is always on the lookout for artifats with power so he can change the world to his liking. The art is wonderfully done by Pascal Ferry, one of my favorites Shawn McManus, Peter Snejbjerg and DUncan Fegredo. The scripting was done by Mark Shultz of Caddilacs and Dinosaurs fame, Steve Aylett, Brian K. Vaughn and Ed Brubaker. 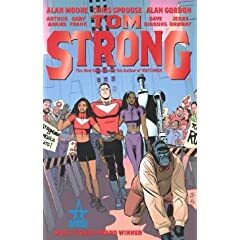 If you haven’t yet checked out Tom Strong I would recommend you do so, it is really great stuff and it’s comics the way they should be, pure entertainment.